This polished side table takes the best of traditional design and gives it a contemporary twist. 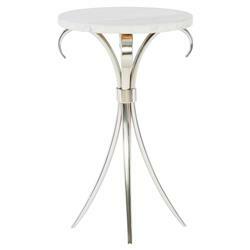 Exceptionally eye-catching, this side table features a gorgeous feminine silhouette with a radiant white stone top. This glamorous piece will instantly add subtle refined beauty to your space.